Elbridge Thomas Gerry (July 17, 1744 – November 23, 1814) was an American statesman and diplomat. 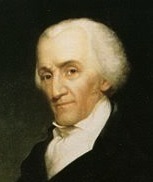 As a Republican he was selected as the fifth Vice President of the United States of America, serving under James Madison, from March 4, 1813 until his death a year and a half later. Gerry was the first Vice President never to run for President of the United States.